Norton’s Hop Farm sells heirloom, Cascade and nugget hops. Last year his hops were used by six local breweries. Don Norton started his hop farm in 2007 during a shortage when he first wanted to home brew. He only has 1 acre of hops, but is hoping to expand. SPRINGFIELD, Ore. — Don Norton likes to think outside the box. Along with growing organic hops, Norton and his wife, Tina, also add value to the plants by selling vines and making wreaths, and by leasing out his picking equipment. 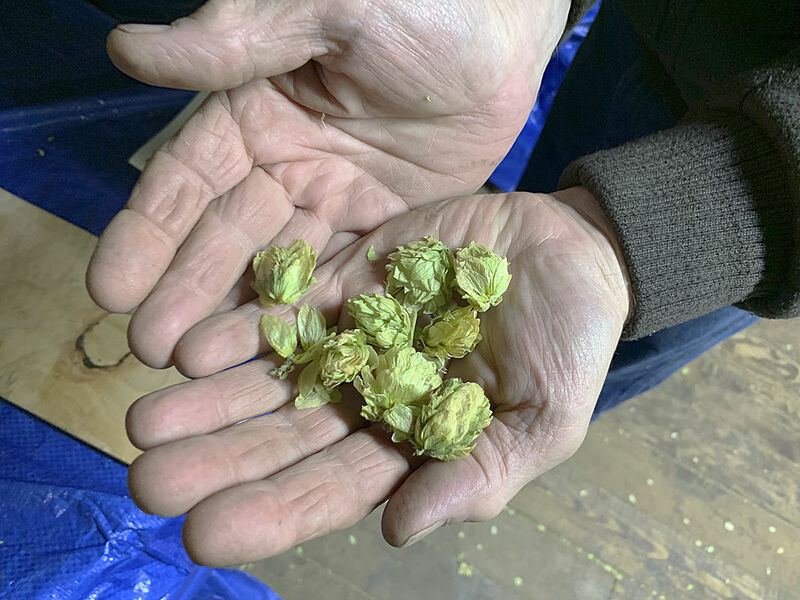 Don Norton first got interested in growing hops because he wanted to home brew, but in 2007 when he heard about a hop shortage, it confirmed that this was a market he wanted to explore. Although he had no sales when he first started producing — which he said is “supposedly a no-no because you’re supposed to have the hops sold before you even put them in the ground” — he marketed and sold his product until he landed what is now a 10-year-long local customer: Mountain Rose Herbs. “It worked out,” he said. The other side of the operation is Tina Norton’s focus. She sells hop vines and wreaths made of the vines to antique shops and florists, and they have been featured at special occasions such as weddings and funerals. She started the project after shoulder surgery when she needed something to do. A small operation, Norton’s Hop Farm has 1 acre of heirloom, Cascade and nugget hops. Don Norton said that everyone loves Cascade and they’re the easiest to sell, but he mainly picked them to grow because that’s the hop he likes. Norton didn’t have any background in farming when he started, and said he learned about farming and organics at the same time. He added that it was probably for the best, as he didn’t have to learn how to transition from conventional practices. He added that “getting better dollars for the product” was an incentive as well. The farm has gone through several changes over the years, including in its clientele. After Norton bought a hop picker, he leased a 2-acre abandoned hop farm in the area where he was able to harvest 800 pounds of hops. That year, he sold hops to six breweries in the area, including McMenamins and Viking Braggot. He was able to sell out. Unfortunately, Norton said, the lease fell apart, but it’s given him time to focus on expanding his own field. Although it’s going to be a couple of years before he has more hops to share with the breweries again, he said that he has a good relationship with them. Although Mountain Rose Herbs has been good to the farm, Norton said his goal is to continue expansion and work on gaining back more of the brewery clients. Down the line he wants to buy a pelletizing machine so they don’t have to wait for the fresh hop season. Despite the ups and downs that come with the business, Norton said that the farm has been a good adventure.